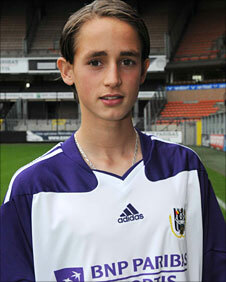 Manchester United are set to sign Anderlecht's teenage midfielder Adnan Januzaj, according to the Belgian club. The two clubs have only to agree the terms for the Belgian 16-year-old, with the fee believed to be about £297,000. Anderlecht wanted to keep the highly-rated attacking midfielder, who is of Albanian descent and joined the club from FC Brussels in 2005. But they do not plan to stand in the way of him joining the current Premier League leaders. Fifa rules stipulate that players under the age of 16 cannot move between European clubs. But having waited until 5 February when Januzaj crossed that threshold, United will be able to pay the Belgian club a minimal fee for him before his price begins to rise. According to Anderlecht the "deal is done" but the two clubs must arrange the fee which can be paid up front or can be incentive based dependent on appearances. Manchester United would not comment on the deal when contacted by BBC Sport. Fifa has recently introduced a Transfer Matching System to improve the transparency of such deals where both clubs involved can register as much information as possible about the transfer. Any agreement between clubs must also be ratified by a player status sub-committee. Since January 2010 there have been 1,752 transfer applications entered into the system for minors with 1,123 accepted and 255 rejected. The remainder are in process. But there is still a lingering concern that bigger European clubs with vast scouting networks are able to offer incentives to youngsters, therefore denying smaller clubs of ample rewards for developing players. There is also the issue of whether young players make the right choice in going to a bigger club where their chances may be limited. In 2009, French club Le Havre accused Manchester United of "stealing" French midfielder Paul Pogba. And in 2007 Lazio were unhappy with the pursuit and signing of Italian striker Federico Macheda, who was 16 at the time. Barcelona recently described Arsenal's purchase of Jon Toral as "a little immoral". The 16-year-old midfielder moved for a fee of about £296,000. But Arsenal manager Arsene Wenger said: "We have done what is legal. Plenty of players leave us under exactly the same rule."